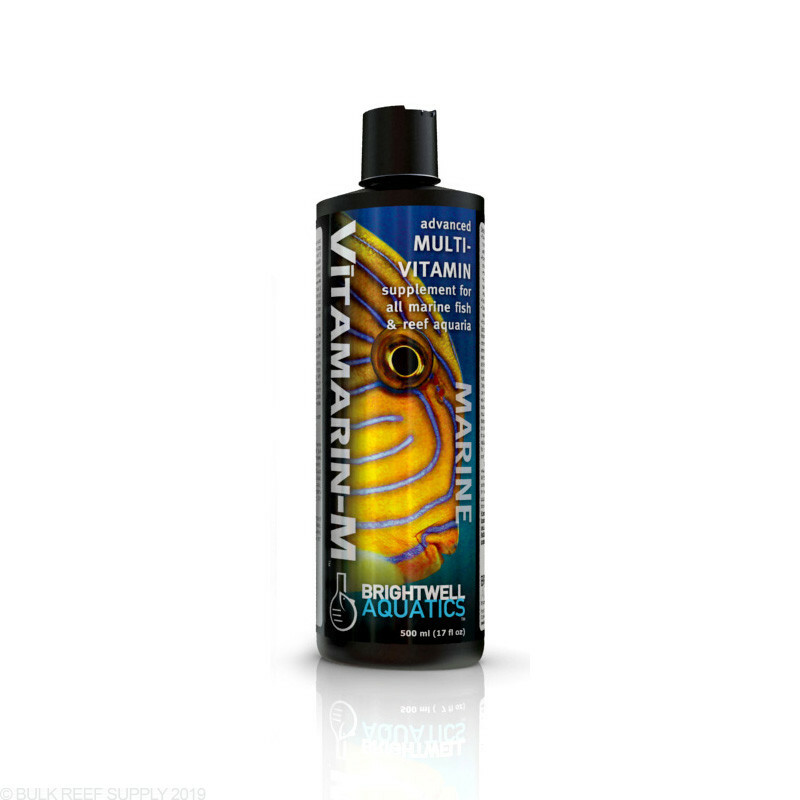 Full-spectrum vitamin supplement formulated to benefit marine fishes, corals and other invertebrates, and other marine aquarium inhabitants. Provides a full-complement of vitamins in the same ratios found in the tissues of filter-feeding marine invertebrates, organisms that extract plankton from the surrounding water and gain their nutritional benefit, and which are in turn consumed by many reef inhabitants. Place food in a clean container such as a small bowl or cup and add only enough Vītamarin-M to saturate. Allow at least 5 minutes to elapse before feeding, enabling adequate time for the vitamins to become thoroughly absorbed by the food. Liquid food suspensions may be fortified by adding 1 ml (approximately 8 drops) Vītamarin-M per 10 ml of food suspension; stir to mix and allow 5 minutes to elapse before feeding. Maximum benefit of any liquid food suspension is achieved when the food is target-fed to the intended organisms rather than poured into a stream of water and allowed to disperse randomly throughout the aquarium. Begin by adding 2 ml (approximately 16 drops) of Vītamarin-M per 20 US-gallons of water weekly for the first four weeks of use; this corresponds to adding approximately 2 drops per 20 US-gallons each day. Then, gradually increase the weekly dosage to 4 ml per 20 US-gallons over the following four weeks and maintain this dosage. [Note: if using Vītamarin-M in conjunction with Brightwell Aquatics Kōralle-VM, decrease dosages by 50%.] Starting at a low dosage will not cause any harm to the livestock, and will enable you to notice subtle changes in the appearance of the system that indicate the effectiveness and need for the product. Vitamin-A Propionate (min): 19.5 IU/oz. ; Thiamine (B1) (min): 15.6 mg/oz. ; Riboflavin (B2) (min): 15.6 mg/oz. ; Niacin (B3) (min): 265.6 mg/oz. ; Pantothenic Acid (B5) (min): 39.1 mg/oz. ; Pyridoxine (B6) (min): 15.6 mg/oz. ; Biotin (B7) (min): 0.8 mcg/oz. ; Folic Acid (B9) (min): 2.0 mcg/oz. ; Cyanocobalamin (B12) (min): 3.8 mcg/oz. ; Ascorbic Acid (C) (min): 359.4 mg/oz. ; Cholecalciferol (D) (min): 1,560 IU/oz. ; Tocopherol (E) (min): 45.5 IU/oz. ; Menadione (K) (min): 0.016 mcg/oz. Vitamins are compounds required in minute concentrations for vital metabolic reactions; the amounts of vitamins required for a given species varies. Short-term vitamin deficiencies can typically be tolerated by most organisms, however long-term deficiencies tend to result in abnormalities, poor health, and eventually even death of the specimen. Conversely, if severely overdosed, ingested vitamins can have a negative impact on a specimen by way of toxicity, though the impact is unlikely to be permanent. Decreasing the vitamin dosage typically results in full recovery of the affected specimen. For these reasons, it is recommended that Vītamarin-M be utilized either as a means of delivering vitamins to aquarium inhabitants through food or by direct addition to the water, but not both. Vītamarin-M does not require refrigeration, however storage in a cool, shaded area will prolong the activity of the vitamins. Refrigeration will maximize the shelf-life of the product.